Just testing the comment feature on the new Open Durham site. I would like to see this building highlighted on maps, and on wayfinder signs planned for each end of the R. Kelly Bryant Bridge. This church also housed True Way Holy Church from the 60's to 1995. It was purchased by the late Bishop WA. Jones and housed the True Way ministry . the two bulidings together. The True Way Church later move to it's current sanctuary 4124 Fayettevile Rd. in 1995. For a complete history on this church please call the True Way 919-544-5398. The current Pastor is Elder Nina B Jones. Also the street was later named Gillette Ave. it is currently Humphrey Street. I repeatedly would see the back of this old church from the Durham Freeway while driving under the R. Kelly Bryant bridge - I finally explored this little strip of land between East Pettigrew until I found it and the north side of the bridge. Mrs. Barrett remembers when the church members would sit on wash benches with no backs. "We didn't have a lot of money, so dues were about 25 cents a week," recalls Mrs. Barrett. In 1910-1912, the ever growing congregation was situated in a school building. With the encouragement from one of the local pastors the congregation began to build a community church building. He suggested the church be named Ebenezer. It was in 1912, under the leadership of Rev. E.J. Carrington, the congregation moved into a little wooden church on the corner of Glenn and Sowell Street. Some years later, the wooden structure was torn down and a stone church was rebuilt in the same location. In 1951, the church, under the pastoral of Rev. T.A. Grady, took on the task of building a new church that would accommodate its ever increasing membership. Ebenezer was located on Glenn Street until 1968. 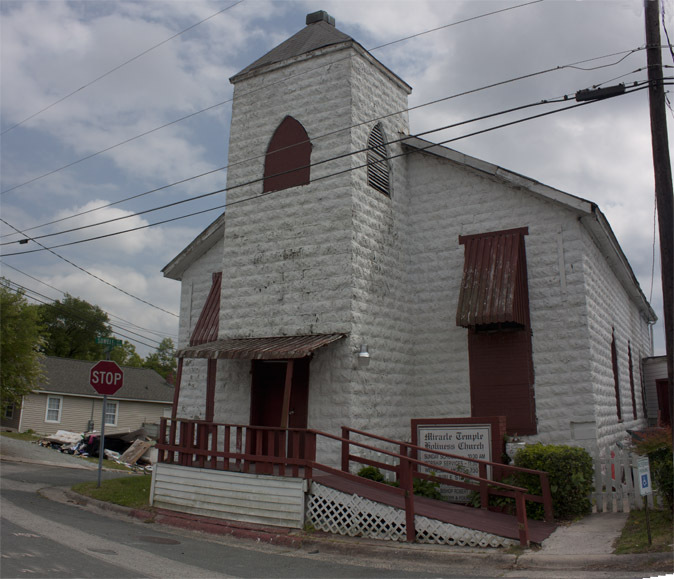 Due to construction of the East West Expressway, the church was forced to move to its present location on 2200 South Alston Ave.